Shiulie Ghosh is a television journalist, currently working for Al Jazeera English. 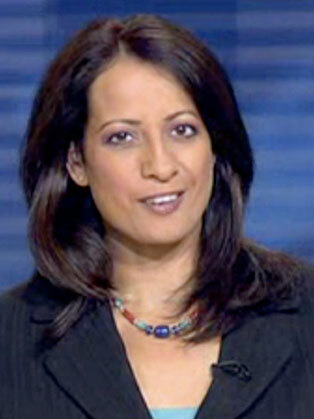 Shiulie Ghosh is based at the Al Jazeera English main bureau in Doha in Qatar. She is an anchor on the flagship programme Newshour and also hosts the programme Inside Story. Shiulie Ghosh began her career as a Programme Assistant at Radio Cleveland. In 1990 she was accepted as BBC News Trainee and worked in various posts at the BBC for the next eight years. In 1998 she joined ITV News and in 2001 she was named Best Television News Journalist at the British Telecom Ethnic Multicultural Media Awards (EMMA). In July 2006, it was announced that she was to leave ITV News in the run-up to the launch of al-Jazeera's much-delayed English-language service, Al Jazeera English. Ghosh was the opening anchor on the station's launch in Doha on 15 November 2006 and has been with the channel ever since. In addition, she hosted Every Woman, a show focusing on women's issues from around the world, for which she won the Editor's Choice Media Excellence Award from the Association of International Broadcasting. Ghosh was featured in Qatar's winning 2022 FIFA World cup bid presentation video.